Now cPanel officially support Greylisting software on new version cpanel 11.50 . Greylisting protect from untrusted network email server and unwanted emails .It works , if the first message is rejected from our server then the next email or message received from same server will be accepted after some time passes.The sender email server information will stored in Greylisting database for expireation-interval.The message will be accepted when the time interval pass grey –interval. In the mean time before grey-interval passes , if sender send again message , they greylisitng again penalty is added. 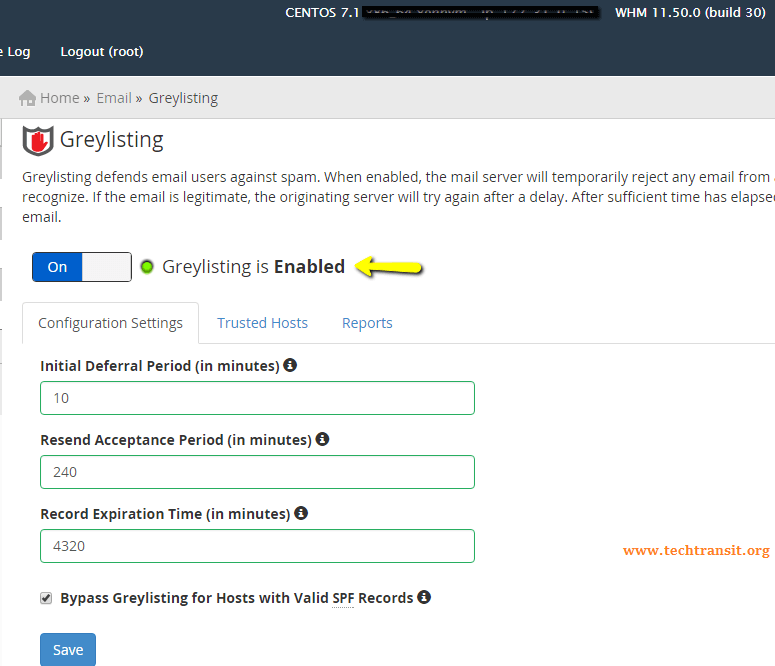 Here now we can enable and configure Greylisting on cpanel , by default it is disable in cpanel/WHM Configuration. Find in control panel of WHM Greylisting as below ..
Greylisting was disabled on the server , when I have fresh install on centos 7 . There you can on/off toggle the Greylist. Click on On and enable Greylisting.